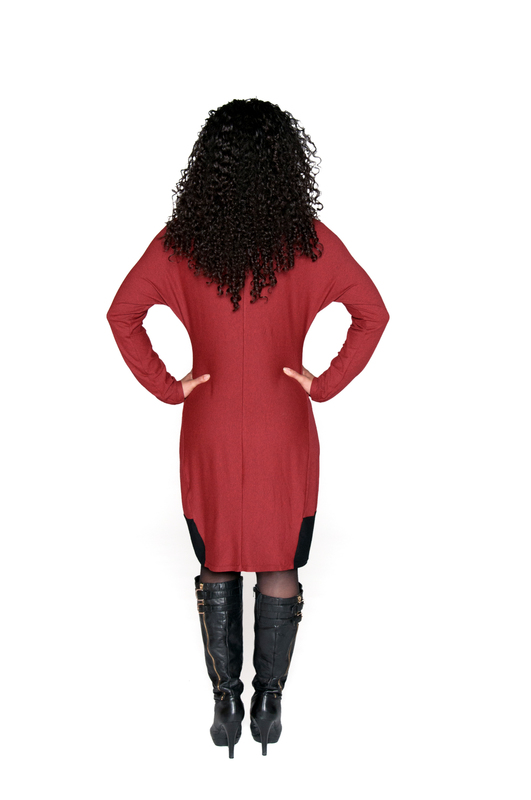 The elegant earthy red rayon knit dress features stylish and comfortable long kimono sleeves, a black bottom band and one large black dot. Combining in its cool design comfort and classic European elegance, Julia is sure to become your all times favorite. It can be transformed from informal to dressy just with a change of accessories so it is suitable to any occasion. Match girls Little Julia and Little Steph or coordinate with friends Agate or Steph and you will be turning heads at any occasion this season! We use highest quality fabrics, that age beautifully as the colors fade slowly and with every wash the fabric becomes softer. Our MADE IN AMERICA dresses have long-lasting value and our clients wear them happily for many years thanks to The Matching Dots (TMD) classic and adaptable design. Moms tell us that their daughters love their TMD dresses – the small girls grow beautifully in them year after year as the favorite girl’s dress becomes a favorite tunic.